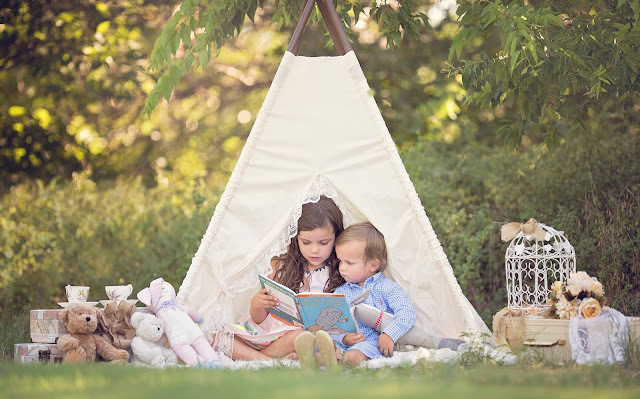 This is a picture of my two kids during a photo shoot we had last summer, and it is probably my favorite of the shoot because it captured this moment where the two of them are reading one of their favorite books, Should I Share my Icecream? from the Elephant & Piggie series by Mo Willems. They are both engaged by the story and are calmly sitting with each other, which was magical. When it comes to my reading philosophy, the bottom line is that I want my kids to love reading. In addition to enjoying the many noted benefits of reading, I want my kids to enjoy the process. I want them to look forward to going to a book store or library and finding books on topics that they are currently interested in. I want there to be times when they are so excited about what they are going to discover in a new book that they can't wait to crack it open. To experience the way a new book has increased their imagination or taught them a lesson, and then share that with a friend or sibling. I want them to see books and reading as fun and exciting vs boring or hard work. 1. Be Involved: Read with your kids, help them select books that they will enjoy over and over again (instead of just once) and make their books easily accessible. 2. Create a Reading Spot: Creating a dedicated space for your kids to read in, makes reading something to look forward to. Whether it is a special chair for them to sit in, a giant stuffed animal they lounge with as they go through a stack of board books, or a bedside table dedicated to housing current favorites, give them a designated spot of their own. 3. Build a Home Library: It is difficult to expect your kids to enjoy reading if they don't have quality books to read. Now, I don't believe that quality means expensive, as a good chunk of my kids books have come from the Goodwill; but rather books that have beautiful illustrations, wonderful story lines and that are enjoyable for your kids to read time and again.